This is Part 2 of our series: The Journey of Painter X3. Check out Part 1, if you haven’t already. So, our Painter X3 story continues. 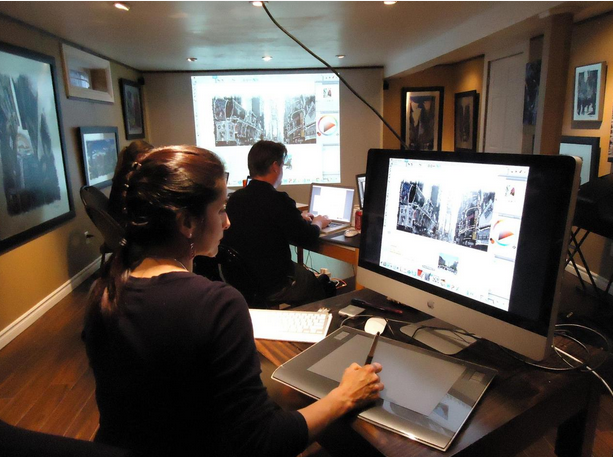 With layers dramatically improved and the brush experience greatly enhanced, it became time to think about the essential workflows that help our artists learn, achieve and grow. That meant exploring some new territory. Again, artists were telling us that the tools that provide guidance help new artists learn but also save experienced artists time. 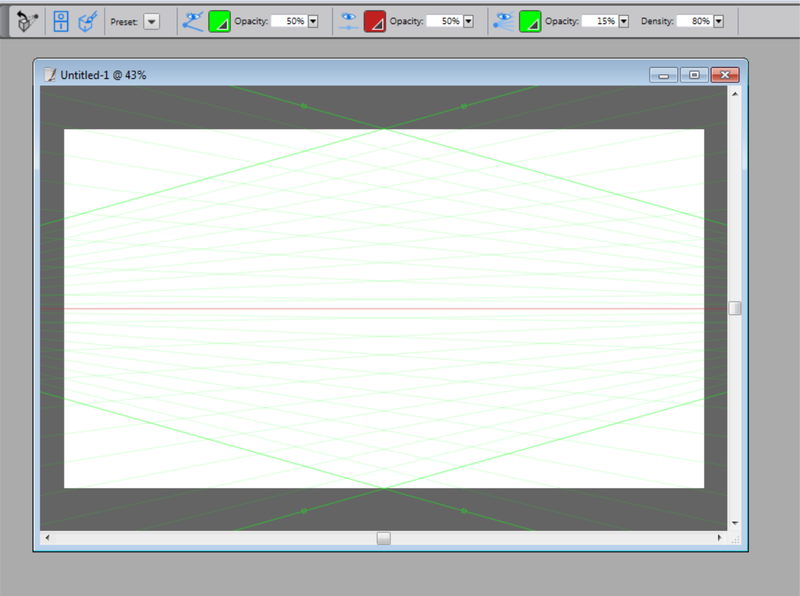 So we explored a variety of helpful tools and landed on a very fundamental one: Perspective. This sent us all back to art 101. It reminded me of looking at all those incredible Renaissance paintings where they used pins and strings to get the perfect vanishing points. Surely, Painter could do the same thing? After a test prototype was built, the response from artists was outstanding! It seemed we were helping more workflows than we originally expected. Along the way, we carefully tuned and improved the feature, and we learned of more opportunities for similar tools in the future. Indeed the enhanced Perspective Guides surprised all of us, artists and developers alike. Now along the way, we actually had the chance to attend classes of students learning Painter. A fascinating take-away for me was this: Some have learned traditionally and enjoy the transition to digital; some learn digitally and stay digital; and some learn through photography and converting that image to digital. The latter is not as easy as it sounds. There I sat in Claudia Salguero’s class, photos ready to clone, thinking it would be straightforward. All I have to do is take some clone brushes and trace, right? Wrong. In fact, it is an art form that requires tremendous vision and skill. The goal here is simple and important: Make the photograph NOT look like a photograph, make it look like a painting. Surprise! That actually requires a huge amount of time, effort and – guess what – a lot of painting. But it is a skill that can be learned and I was fortunate to have a Master teach me. Learning new techniques with other students at Claudia Salguero’s class. I was also able to attend Karen Bonaker’s online class at Digital Art Academy and even watch pros like Jeremy Sutton and Paul Tumason paint right in front of my eyes. It didn’t take long to see the opportunities to smooth out the workflows and make life easier for them—the art is challenging enough! So from there we combined a feature from Painter 11 – the cloning crosshair – with a feature from Painter 12 – embedded clone sources – into a smoother, simpler cloning experience. This side-by-side cloning is something that all artists will appreciate as not all workflows operate smoothly with tracing paper. And the added bonus of easily adding and updating clone sources makes life faster and simpler for everyone. Karen Bonaker demonstrates the new X3 cloning workflow that integrates the crosshair with clone sources. The multiple sources are used to create a beautiful impressionist painting. The other thing we learned is that cloning isn’t just for photography. We see some really cool examples of artists cloning and enhancing their own digital art. Imagine revisiting a digital illustration you did a few years ago with modern brushes and effects. Instead of making the whole new painting from scratch, you could add or enhance specific layers and reissue a fresh painting, saving time and effort. Truly inspirational! As we continued learning about Painter, we heard more and more about color. We added 4 beautiful color mixers from our artists, two of which are arranged in a more artist-friendly yellow-red-blue space, as well as two that suggest a more limited palette based on real paintings. We also improved the dropper being the default tool and created the ability to limit the number of colors sampled from the painting; small but helpful improvements on our initial foray into color improvements. Inspirational mixers from X3, default on left then showing Skip Allen, Karen Bonaker, John Malcolm and Jeremy Sutton’s mixers, respectively. The last key workflow item we kept seeing and hearing about was reference images. It was amazing how many artists utilize references, from illustrators taking pictures of models to traditional artists referring to studies of the old masters. On just about any given project a reference is used, be it inspirational, technical or even just for sampling color. So with that, we finally built a Reference Image feature. It is quite a simple feature that we expect to grow and improve, but even now we know of many artists who enjoy this feature. And in the end that is our goal: Grow and improve with our artists as we listen to what they have to say about digital art. It is their voice that helps us evolve Painter in a way that makes sense to them. Don was right…it’s about the art….it’s about the artist. And X3 is just the beginning! Have you tried Painter X3 yet? What feature has made the biggest impact on your artwork so far? This entry was posted in Digital art and tagged Artists, Digital art, digital painting, Paint Program, Painter X3. Bookmark the permalink. So when are you going to make it OS X compatible? Painter X3 is compatible with Mac OS X 10.7 and 10.8. No, Painter X3. Sorry for the confusion. That’s my point. I need PSP X3, BUT, I refuse to use Windows to access it. 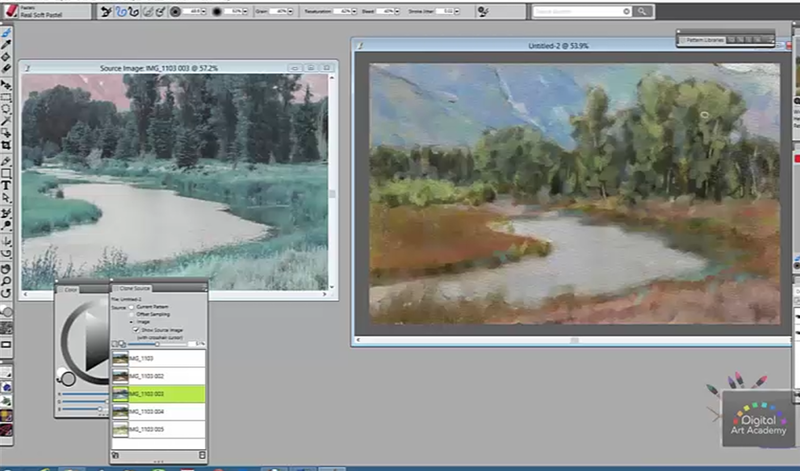 Interesting blog to help painters understand the nuances of using the Painter X3 to enhance their paintings.